Berlin, Germany. 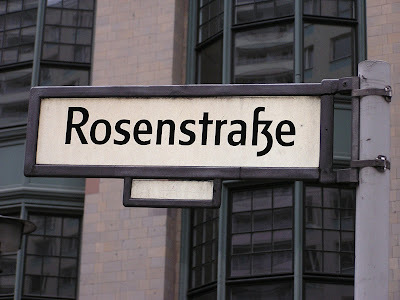 Rosenstrasse street sign. photo: Samuel D. Gruber 2003. Berlin, Germany. Rosenstrasse Protest Monument, Ingeborg Hunzinger, sculptor, 1995. Photo: Samuel D. Gruber 2003. 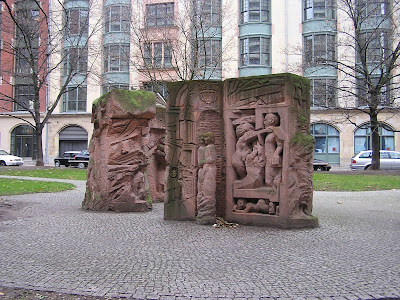 Since a recent visit to Berlin I've been posting about some of the less well known Jewish and Holocaust-related monuments and memorials in the city. I've already posted about the Münchener Strasse Synagogue monument, the Jewish cemetery on Grosse Hamburger Strasse, monuments and markers at U-Bahn and S-Bahn stations, and the monument and burial section at the Weissensee Cemetery for Jewish soldiers who died in World War I. Today, because it is International Women's Day (shouldn't every day be? 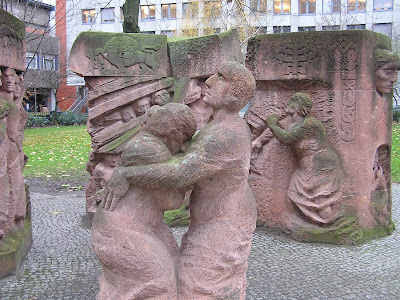 ), I introduce the very dramatic sculptural ensemble commemorating the Rosenstraße.demonatrations of 1943, when hundreds of German women who were wives and mothers of Jewish men, protested for a week to have their men released from Nazi custody. 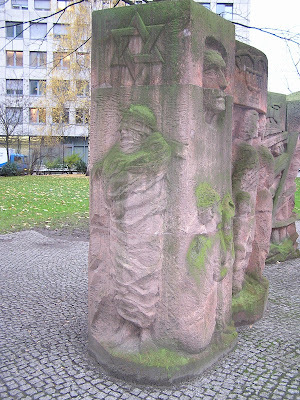 First a new street kiosk (known as a Litfass column) was erected close to the site of where the men were detained. This new information kiosk, which provides history of the events, recalls an earlier kiosk on the site in 1943. We know this from photos taken at the time by who was among those imprisoned men subsequently released. Read more about the memorial here. 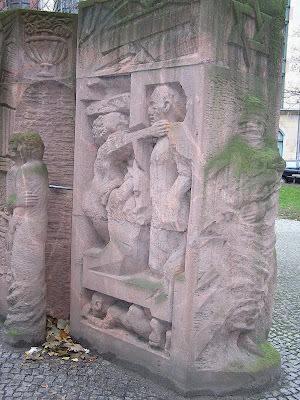 The main work - is the sculptural group "Block der Frauen" ("Block of Women" monument), carved by sculptor Ingeborg Hunzinger (1915-2009), and dedicated in 1995. Hunzigern, a communist who has studied in Berlin in the 1930s until she was forced to emigrate, had worked with the prominent East German sculptor Fritz Cremer in the 1950s, probably when he designed the monument at Buchenwald. 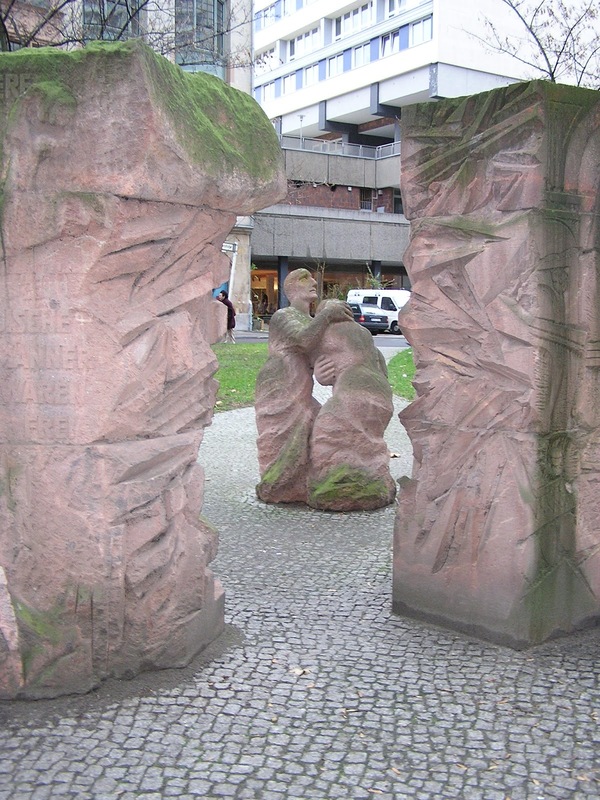 Hunzinger designed the Rosenstrasse monument in the 1980s, but policies in the GDR (East Germany) prevented its acceptance and installation. In 1995, after German unification, the new Berlin Senate vote for its creation. 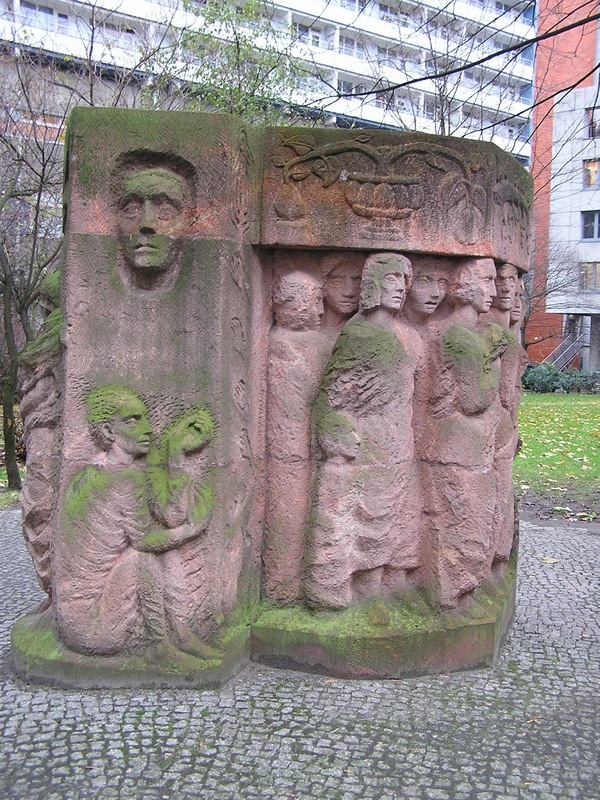 Cremer's heroic Buchenwald work is primarily a Communist national monument collecting all inmates as anti-fascists, and celebration the Communist struggle agaisnt the Nazi regime. despite the presence of Jews early in the history of the Buchenwald camp and again in its last months, there is nothing specifically Jewish in any of Cremer's designs. 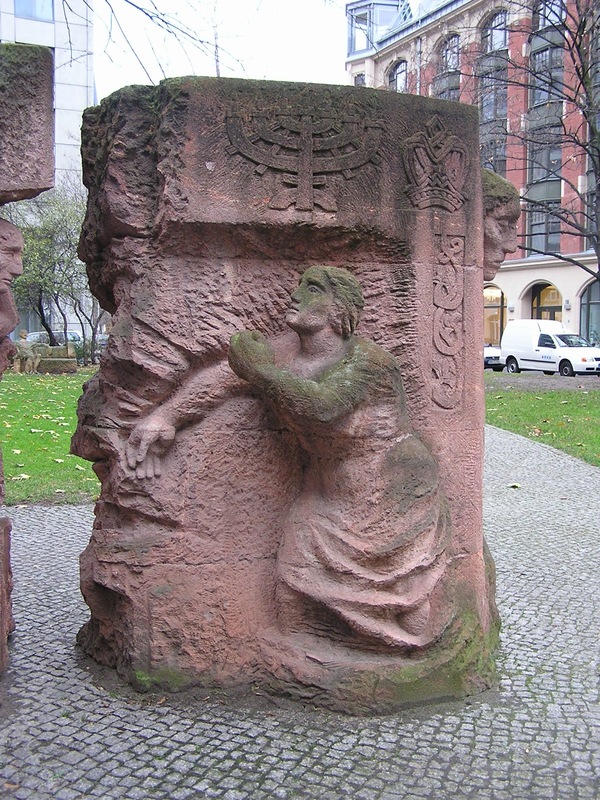 Hunzinger, however, even though she is celebrating the bravery of German Christian women, fills her carved blocks with Jewish symbols. She also allows her work to express both collective anger on near mythic scale as well as more intimate personal grief. Hunzinger's work calls up the dram of Greek tragedy in the massive blocks of soft red stone that spill across the plaza - much as the demonstrators themselves must have slowly and bravely come forth first as individuals and then en mass. The sculptural group of sculptures is located near the site of the former Jewish administrative building in which the Gestapo held the men captive, which was subsequently destroyed in the war. 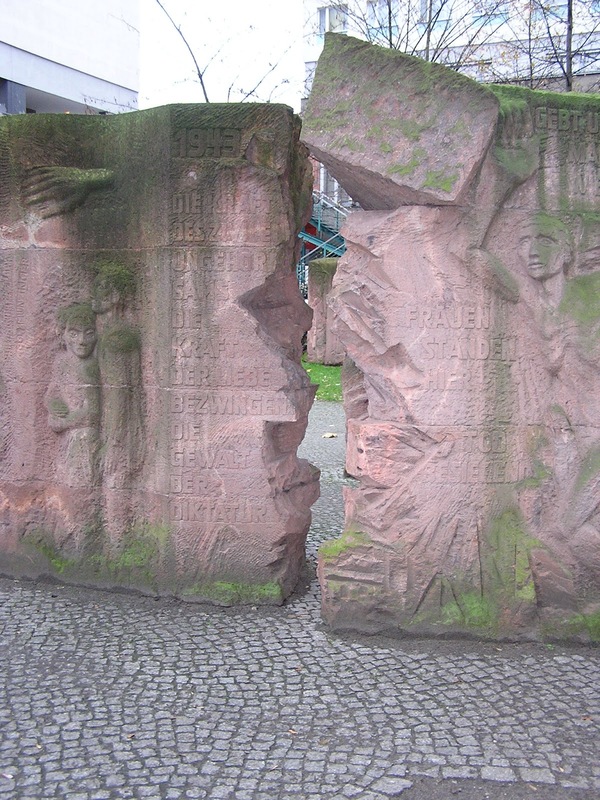 The inscription on the rear of the monuments reads: "The strength of civil disobedience, the vigor of love overcomes the violence of dictatorship; Give us our men back; Women were standing here, defeating death; Jewish men were free." Though the Rosenstrasse protest is now more well-known (there is even a movie), when the monument was deigned in the 1980s and then finally installed and dedicated in 1995, the story was little known. In fact, it is the rare instance where German civilians actively protested Nazi policies and actions. In ten years of Nazi rule, after the first brutal crackdowns in 1933 until 1943, such public resistance in Berlin and elsewhere was unknown. The women risked their lives to successfully gain the men's release and many of the prisoners managed to survive through various means until the end of the war. Read more about the protest here. 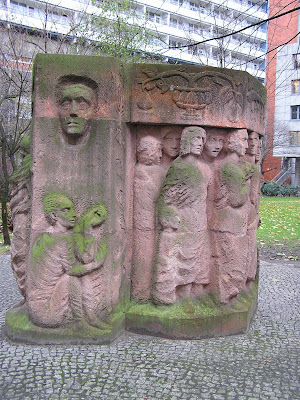 Adjacent to the sculpture is also the site of Berlin's now-destroyed oldest purpose-built synagogue, the Heideruetergasse Synagogue opened in 1712. The synagogue was damaged on Kristallnacht and during Allied bombing, and the remains were demolished in the 1960s.